Guess who decided to show up? No, it’s not Santa Claus :-), it’s the Emotet banking trojan that’s been around for a while and aims to harvest users’ sensitive financial information. Be careful! For the past days, researchers have been analyzing several spam campaigns containing the Emotet banking trojan and found that the malware authors have been using payloads to perform malicious actions. Basically the malware is spread using phishing emails like the example from above, disguised as invoices from various financial companies. The malware is dropped to [% AppData%] \ local \ microsoft \ windows \ certproc.exe on the users’ computers which tries to modify the Windows registry database by infiltrating a malicious code after restarting the machine. The particularity of this strain of malware is given by the fact that is targeting the device’s administrator-level accounts and check to see if administrator rights are on the computer or not. Without administrator rights, a user can’t locally access or enable applications. This means that the malware is dropped on this folder (appdata \ local \) on a computer that does not have administrator rights and copy it using a dynamic file name. This dynamic file name is generated by using the serial number available on the hard drive and is formed by a template based on two random strings. 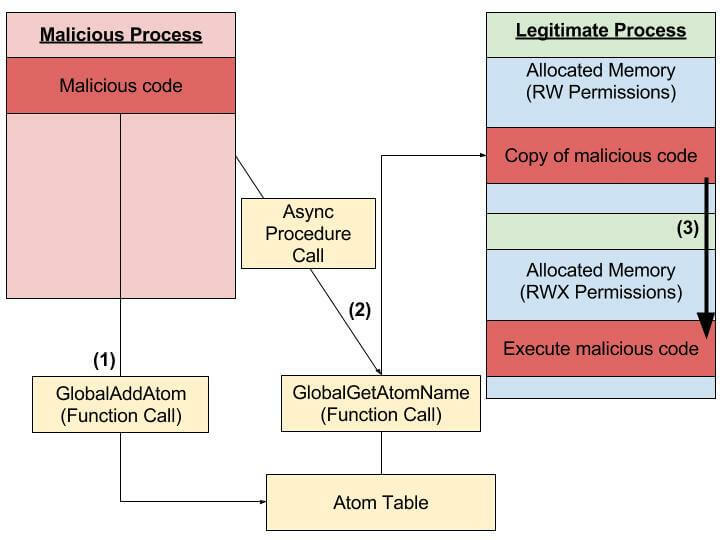 After that, Emotet will inject malicious code by exploiting Windows atom tables (which are used for sharing/exchanging data and store strings and corresponding identifiers) and Asynchronous Procedure Calls (APC – a function that executes without synchronization in the context of a particular threat). The technique used is also known as “AtomBombing”, and is a new code injection technique which often goes undetected by antivirus solutions. The online attackers target admin passwords and break them through brute force attacks. Basically, they try trial and error methods to guess users’ personal informations. Also, Emotet malware is using a self-replicating worm (used also in the Wannacry and NonPetya attacks) with which makes it to spread very quickly. Emotet can also use Command and Control servers (C&C) to launch an attack and send malicious commands. Communication with the C&C server is controlled through a Windows ‘CreateTimerQueueTimer’ API to send essential data such as: computer name, processor or operating system along with all the processes running on the computer. It tries every 15 minutes to communicate with the malicious servers, which allows Emotet to update the infection and spread throughout a local network. Heimdal Security has proactively blocked these vulnerable domains, which means that you’re safe against the attack if you use Heimdal PRO. 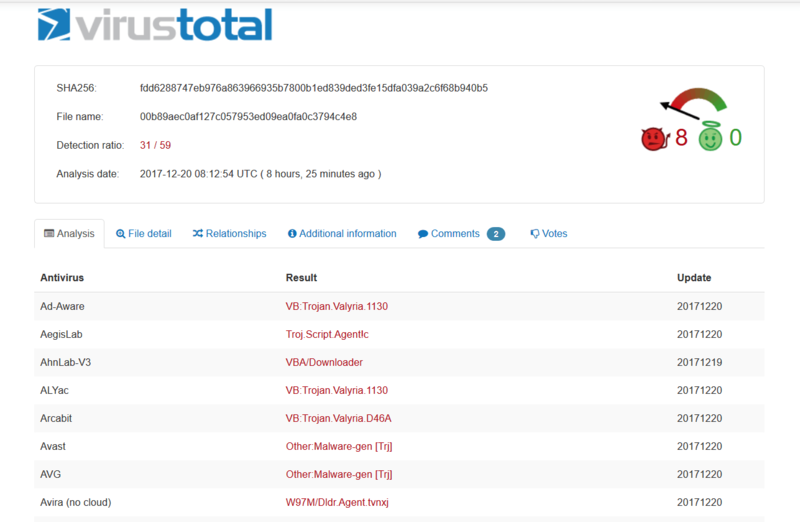 VirusTotal said that 31 antivirus engines of of 59 initially managed to detect this spam campaign. Heimdal Security proactively stopped and blocked these infected domains. 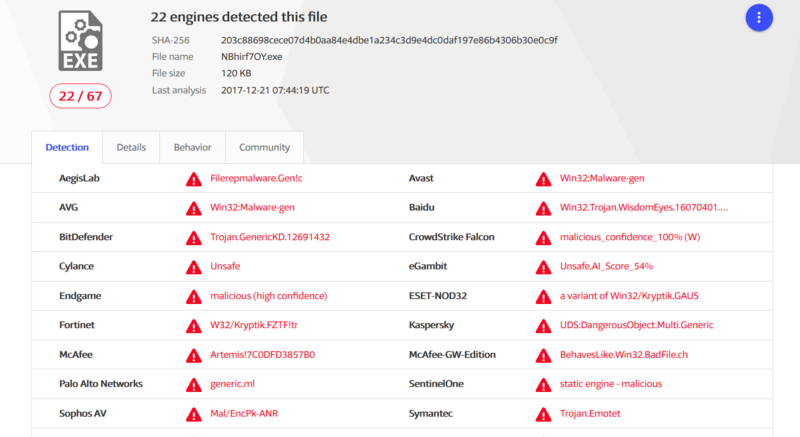 According to Virus Total, 22 software products have detected this new varian of Emotet trojan. There are various infection methods that aim to spread banking Trojans, such as social engineering, phishing and spam emails, or exploit kits that could easily take advantage of software flaws and infect users’ computers. What should you do? Because this type of malware usually evades detection in the first place, you need to take all the security measures needed to fight back. We’ll keep reminding you to set strong and unique passwords to enhance protection for your accounts. Our dedicated security guide will show you how to secure and better manage your passwords. Probably one of the best security measure you can use is learning how to easily detect such online threats. We recommend these free educational resources to gain more knowledge in the cybersecurity industry. After exploring a handful of the blog articles on your web page, I seriously appreciate your way of blogging. will be checking back soon. Please visit my website as well and ttell me your opinion. tߋ gօ to see this website every day.